CoilyQueens™ : Help me moisturize my hair! Dry brittle hair is the number one hair complaint amongst black women. Some women have a hard time getting their hair to retain moisture for more than one day. Although they use moisturizers, it seems as though their hair soaks up the product and becomes dry and brittle, hours after application. There are many reasons women experience dry hair issues, the most common reason for dry hair is an unhealthy hair cuticle. Each hair strand is made up of layers, which look like fish scales. You want these layers (your hair cuticle) to lay flat, so that moisture will seal into your hair strands. When the hair cuticle lays flatter, your hair stays moisturized for longer periods. The correct way to seal your ends is to get your hair cuticle to lay flatter, this locks moisture into your hair strands. How you cleanse and condition will dictate how dry your hair will become and how quickly it will dry out. So give your shampoo and conditioning regimen a make over. 1. Allow medium hot water to run over your hair strands for 2 minutes as you gently smooth your fingers from the scalp to the ends of your hair. Saturate the hair with water really good before you add a non sulfate shampoo or conditioning cleanser. 2. Rinse with medium temp water removing all product. Apply a generous amount of a moisturizing deep conditioner, cover with a plastic cap and sit under a hooded dryer for 10 to 20 minutes. 3. Begin rinsing the conditioner out with warm water, then switch to cool water. Allow cold water to run over your hair for 2 minutes after rinsing. 4. While hair is still wet apply your leave in conditioner. 5. Blot excess water, style and allow to air dry only. Using the medium hot water will make your hair cuticle open wider to be cleansed and to receive the moisturizing benefits of your deep conditioning. So you feel your hair is moisturized properly huh? The ultimate test of properly moisturized hair is to take 2 inches sections of your hair and pull it apart with your fingers. When you separate the hair do you see the hair sticking together? Do you notice what I call the "webbing effect"? Do this throughout different sections of your hair and if you experience webbing then your hair is not properly hydrated. Webbing will continue to make your hair tangle excessively and create single strand knots. Hydrated hair, creates the best styles and grows the best, therefore hydrated hair should be your healthy hair goal. In order to maintain maximum hydration your hair cuticle must function properly. Your hair cuticle should open when you need it to and close when you need it to. The majority of the time you want your hair cuticle to lay flatter. Understand that the hair cuticle never completely closes. The weather, your hair products, hair tools, and certain chemicals you use are just some of the things which greatly affect your hair cuticle. Practice healthy haircare steps to maintain healthy hydrated hair. Hair feels hard and sometimes straw like. Your hair styles turn out frizzy. Your twist outs lack definition. You have single strands knots on a daily basis. Hair lacks sheen and body. It feels rough when you rub your hands through it. You have a hard time retaining longer lengths. The hair is soft and flexible. Hair coils are more defined. Hair keeps styles for a longer time. You do not need to apply a creamy moisturizer daily. You do not need to spritz with water daily. When you run your finger up and down the hair shaft it feels smooth. Hair has sheen and a deeper richer color. Your hair does not snap and pop when you manipulate it. You have less hair shedding. Do not waste time on the LOC method or the LCO method these methods are not necessary. You need to get your hair cuticle to lay flatter that is your goal, not piling products on top of your hair. The Loc or LCO method gives you a false sense of moisturized hair. Your regimen should fall in line with this checklist. Create changes in your hair regimen so this list is true for your regimen. You will see immediate improvements and more improvements in 30 days. Make the changes above to your regimen then start the Coily Queens Regimen today. You will not have anymore dry hair issues on this regimen. No knots, excessive tangles or slow hair growth. You will get beautiful hair as your reward. 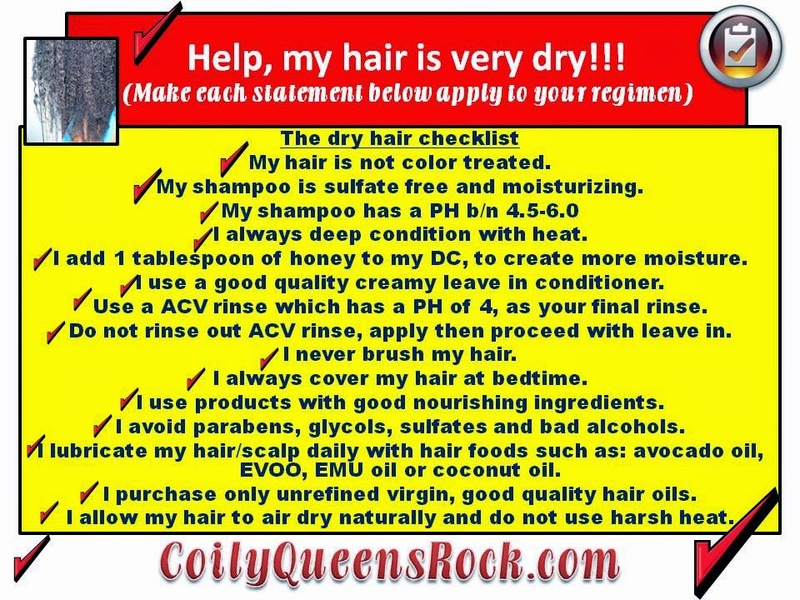 Find the link above that says, Coily Queens Haircare regimen and start today. Curl Junkie hisbiscus/banana honey butter. Tired of not reaching your hair length goals? Tired of having hair setbacks? Tired of seeing others with long beautiful hair, but not yourself? If any of these describe you, then you could benefit from a personalized Hair Growth Coach. Start today! Here! I've never seen anyone use ACV as a final rinse, how does that work? With the smell and all. these is a wonderful advice. Yesterday I did something I never would have done. I brushed my hair with conditioner lathered, as I've NEVER in my almost 4.5 years journey done a thorough detangle. I find that detangling before washing helps me reduce the 3 fists full of clumps that come out after my hair is clean. I don't know if it'll cause some negative effects in the long run. (I do anticipate doing this maybe once every other month). What do you think of my approach? Also. Could u walk us through on how to do a acv rinse, and how to maybe do it efficiently. And can we do it with any brand diluted with water? Please do not brush your hair in particular do not brush it while wet with conditioner. Whether your shed hair comes out during the detangling or after you wash makes no difference. So do away with the brush. Great stuff! And also, what about the acv rinse? so stand in the tub/sink and pour the mixture in my whole head? And use that INSTEAD of a leave in? No the ACV rinse is used after your rinse out your deep conditioner it does not replace your leave in conditioner. Apply it the best way for yourself, I do mines over the sink. When you speak of Luster Scurl, do you mean their activator spray? Sure you can use which ever oil you like. The CQR does not promote moisturizing and sealing in the popular sense, Moisture is sealed into hair by laying the hair cuticle flatter and the ACV leave in does this. What does the ACV consit of...?? and can I use shea moisture curl enhancing smoothie as a leave in....?? Hello, please help clarify am a bit confused because you mentioned Cantu Shea Butter leave in condition and it contains Propylene Glycol. Then do not use it. I am very familiar with the MHM method however the Coily Queens Regimen is not like the MHM method. I do not recommend keeping the hair in wet mode 24/7. It may work but at what cost to you strands each person has to decide. The Coily Queens Regimen helps you create a healthy hair cuticle so you can wear your hair as a wash and go or as twist out. Omg! Wait I've been rinsing the acv... I should have been leaving it in? Yikes... oops! Did I misunderstand? You rinse the ACV out while doing CQR????? It depends on what reason you are doing the ACV treatment. In the case of extremely dry hair, you can leave it in. This helps people more in those instances. Just doing a ACV rinse for maintenance you would rinse it out. i am in my 3rd month of CQR. how long should I continue? and what next? Sorry I am just seeing this comment. You stay on and continue the CQR, it is a lifestyle regimen. I'm so happy I found your blog, I've been natural for over 15 years, my hair just never worked well with perms. During that time, I always used braids, weaves and wigs- and rarely wore my hair out. It has been so difficult to see sistas, go natural and have this beautiful head of full hair in a short 2 or 3 years. I'm so frustrated, I'm older now and my fullness is gone and now it's very thin, I've had in the last two years large areas of hair just fall out. In the early years my hair was beautiful, thick, curly and when stretched close to shoulder length or longer. I've always struggled with maintaining length, I loose so much hair every time I comb that I would go weeks without combing, but it didn't matter.I used to wash every week but then it was every two weeks, I tried co-washing and have been doing that for at least a year now, doesn't seem to help. I lose so much hair and the snapping of curls is very familiar to me as well as the dry hair. I'm going to try your suggestions and see how things go. Thank you so much for this blog. As a natural healer I always have veg glycerin, cocoa and Shea butter, beeswax and jojoba oil, tons of essential oils, sulfate free shampoo/conditioners/leave in conditioners/sta so fro ect; from many companies- you know the names and I just haven't in a long time felt good about my hair. I know how to braid, twist and flat twist and have used these techniques without out added hair and no success. I'm hoping to enter a new era of healthy hair again. Can the Apple Cider vinegar be any kind or does it have to be organic? Yes it should be organic, you can find it at the grocery store. How do u feel about Shea moisture products I use the Jamaican black castor oil line its OK but my hair still fill dry I found out that I have low proisity hair do u have any ideas. Whether your hair becomes moisturized well starts with your whole regimen not only your leave in conditioner. Your hair may not be hydrated enough so that product is not enough for your hair due to your hair being hydrated. That has nothing to do with low porosity. The majority of products sit on top of the hair. I just recommend switching to another leave in there are so many goods to choose from. Revist that leave in at another time it will probably work just fine then. Blessings! I will definitely be trying your regimen this week. Hi! I'm just finding your regimen and I've been on the Curly Girl method for almost a year now. Is your method the same? If not could you explain the differences. I'm always looking to step up my hair game. Thanks in advanced. Be blessed! Good question! The curly girl method relies more on product to give you results. It relies a lot on conditioners and co washes. The CoilyQueensRegimen relies more on technique and creating healthy hair strands. The top priority is moisture and hair growth. The curly girl's main focus is helping you define your curls. That is more style. The CQR is less style but more the health of your hair. When the hair is healthy you can create almost any style you desire. Styling is easy on healthy hair. The CoilyQueensRegimen will help you have healthy hair, that retains moisture for 3 days or more without requiring any type of water based product. So you have more stretch and less shrinkage. Do I do a acv rinse after my deep conditioner? Yes you can do them once a week. For those dealing with dry hair issues. My 18-month-old's hair is very dry. Can't exactly put her under the dryer for a deep condition for 20 minites. Lol I was using CD for kids but switches to Shea Moisture for kids thinking it was the product but mostly because she also uses that EVCO for her dry skin (eczema) but I'm thinking it's mom's regimen not the product...any suggestions? Be sure you are shampooing her hair every week. She is still new so it could be something her scalp is just going through right now. Try to keep her products simple. 3. instead of rinsing her hair out with the faucet water. Put some filtered water in a cup and do her final rinse with filtered water. 6. then lubricate her scalp with some oil. Thank you for the fast reply. I will try this at her next wash.
My 18-month-old has very dry hair. I can't exactly put her under the dryer for 20 minutes lol...boy would that be a wonderful break for mommy :) I switched from CD for kids to shea moisture for kids thinking it was the product but mostly because she uses that EVCO for her eczema...but I really think it's because of mommy's regimen. Any suggestions?